Getting ready for an October Disneyland road trip that includes Mickey’s trick-or-treat party. That means we need costumes. 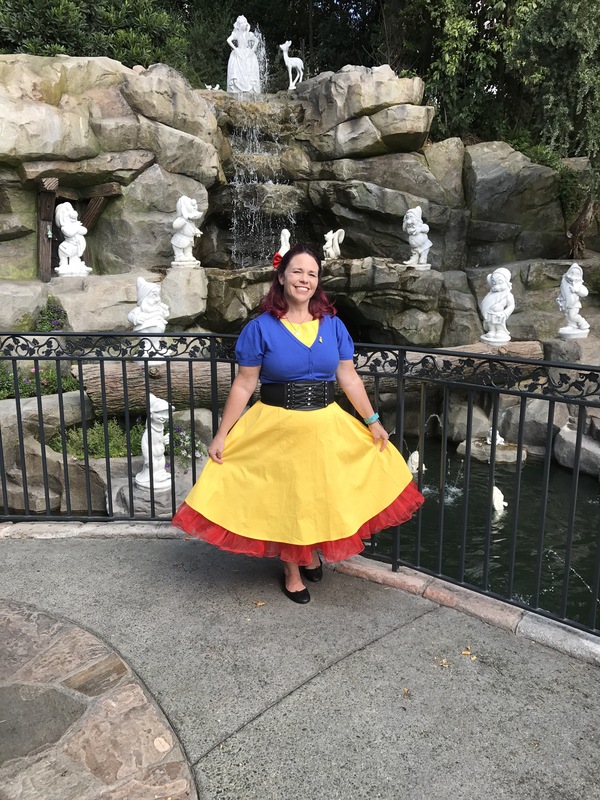 Disneyland has some specific limis on the costumes adults wear. No masks and capes must not be longer than their waist. As you may know, Disney properties have really upped their everyday security measures. Your bags and strollers are checked pretty thoroughly at a security checkpoint. If capable, you must go through a metal detector. As well as you may be check with a detector wand. They have a no weapons with your costume policy. Nothing spiky that could actually poke another guest. They request that you don’t take pictures with other guests in costumes. If you go Disney trick or treaing, you’ll see costumes that look exactly like Disney’s professional costumes. You would suspect that the guest is the actual princess or character from the park. I’m not quite sure of the reasoning for no pictures. FYI, Any other day adults or kids 14 & over cannot wear a costume in the park. I do like to dressup in a way called Disney Bounding. It’s when you wear regular clothes but the coloring and the set up of the clothes resembles a Disney character. For instance, I wore a long, green skirt with a purple top and my hair happens red. The little mermaid, ARIEL. This time I wore a yellow dress with a little blue sweater over the top and I have a red bow in my hair. I’ve heard people say they were sent away at the security checkpoint for bounding. I think it would be hard to prove that you specifically were trying to trick guests into believing that you were the character with bounding. Honestly when you go look around. You will see people with Mickey and Minnie ears and gloves on, as well as Goofy hats, Donald hats and so much more. They are encouraging you to celebrate the characters with clothing. I have not never been questioned for my attire. Going back to prep for our Disney trip. I’ll admit it I totally overpack for myself. I never know what mood I’ll be in just like other trips but Disney is pretty bad when it comes to packing. My boys pack very minimally. I guess that’s one of the differences between boys and girls. Obviously one of the essentials is having your tickets. You can buy them there and sometimes at your hotel but I suggest you get your tickets early. The lines at the Disneyland ticket booths can be very long. Plus you have to go through the security checkpoint first which in itself can be a long line. Maybe it’s just an introduction to the right lines you’re gonna have to wait in later. We are annual pass holders to Disneyland and take several trips a year. In most cases I t’s not worth the price if the annual pass if you don’t go at least twice. The additional discounts in the park and downtown disney relieve so of that monthly fee. There are a ton of hotels near the entrance gates and more are being built. Google maps is your easiest way to seethe location of each hotel. I’ve stayed close for a short walk. I’ve stayed a bit farther for a long walk. I’ve stayed at enough away to drive. My favorite but most expensive hotel is Disney Resort hotels. Specifically the grand Californian. The newest and the most expensive. It’s a treat when we stay on the resort property in more ways than just being close. That’s all for another blog though. Clothes, tickets, hotel and money. All of the essentials right? Best advice of all for a trip? Enjoy the Disney magic. Relax, don’t stress and look around. It’s not all about running to the next ride. Just being in the park can be a thrill if you let it. Let yourself soak it all in.